3000 PSI HONDA PRESSURE WASHER is rated 4.8 out of 5 by 666. Rated 5 out of 5 by McFly from Reliable and efficient. So far it has exceeded expectations. However, I wish the pump assembly was better protected or the wheels were bigger to add clearance. Come over a steep enough slope, a rock or tree root, and that assembly is trashed. Not a knock against Ryobi, most pressure washers are engineered this way...just my take on it. Aside from that, it runs really well and I’m satisfied with my purchase. Rated 5 out of 5 by Popsdriver from I bought this pressure washer 3 weeks ago and what a dream. Very powerful and easy to start. Light weight which helps went moving it around. I would recommend this to everyone looking to buy a good pressure washer. Rated 5 out of 5 by PNW22 from Perfect for the hardworking homeowner I bought this for personal use on projects around the house. I’m beyond pleased with how well it has performed in all facets of its capabilities so far. I have been able to clean up old fence board to use as reclaimed paneling, it’s made washing vehicles a breeze, and it peeled 23 years of algae and grime off my front driveway in under 2 hours. It’s got an efficient Honda motor, capable of many features. The only noticeable thing, that I wouldn’t even consider a downfall, is that the fuel tank is used in about 60-90 minutes of continual use. Other than that this thing is incredible. Would recommend to anyone. Rated 5 out of 5 by Bill55 from Excellent product This is the third or fourth pressure washer I've owned and easily the best. I used it the first day I brought it home from the store to clean my parking pad, walkway and front stoop. It was light, maneuverable and started easier than any pressure washer I've previously owned. I was concerned about the rope pull because of a bad shoulder, but my concern was unfounded. It requires no real strength to start. I used a disc attachment to clean the flat surfaces, followed by the spray wand for tougher areas and cleanup. The result: I can't recall when the parking pad, walkway and front stoop looked so good, at least not since they were new. Rated 5 out of 5 by Hal74 from Fantastic machine Bought this unit about three weeks ago, also bought the Ryobi 15" surface cleaner. Very easy to set up and use. The oversize wheels make moving the unit over uneven terrain a breeze. Very easy to start - I'm 74 and had no problem getting the unit started on the first pull. My sidewalk, driveway, and vinyl fencing looks brand new, now. Amazing power punches through the toughest green algae plaguing my fence for years. The sidewalks were almost black from the ground water I use for lawn irrigation, now they are back to their original color. It was really awesome to see all that black grime disappear with so little effort on my part. Rated 4 out of 5 by Washy from Very good product I would give 5 stars if I had it longer but since I had it only for a week and cannot report on reliability, 4 stars will do. Very easy to assemble and start. Good power - enough for home use. I also bought the turbo nozzle for concrete cleaning which works well. Honda engines are reliable and the features/the engineering of this pressure washer are very good. I choose this 3000 PSI model over the other 3100 PSI model because the 3000 comes with a longer hose and also because it is a newer (2018) model whereas the 3100 PSI is a couple of years older. Also, I think I would not care too much for the Idle Down feature of the 3100. Rated 5 out of 5 by AJ Laffer from Great features, wheel design good, soap ratio This was a replacement for my prior pressure washer which ceased to exist. I like the large wheels that are solid and do not require air to be pumped into them each spring when you use them. I also like that is has a seperate soap dispenser that regulates the amount of soap dispensed. My prior machine did not have that capability. I really like the time it has saved me in cleaning my house. That being said, I wish that the water hookup either had an extension or was a little easier to assess. It still is a better design than my prior washer. I would recommend it. Every product that we have from Ryobi has an excellent track record, so far this one has lived up that expectation. Rated 5 out of 5 by Vinyl Box Owner from The right size pressure washer I wanted a unit with a Honda motor, self-contained soap dispenser and enough power to do the job. This unit met the requirements and appears to be of good quality for a fair price. On first use, it started on the 3rd pull. Run-time was good on a partial tank of E10 gas. It quickly cleaned mildew off of the vinyl siding on one wall of my house. Using an 8 foot step ladder I still had enough pressure to clean to 2 stories with the 20 degree setting. The 5-setting rotating nozzle is very convenient. I keep it in my basement, and it is not too bulky to wheel up and down the steps on the large wheels. The RYOBI 3000-PSI Pressure Washer is engineered to handle even your toughest jobs. 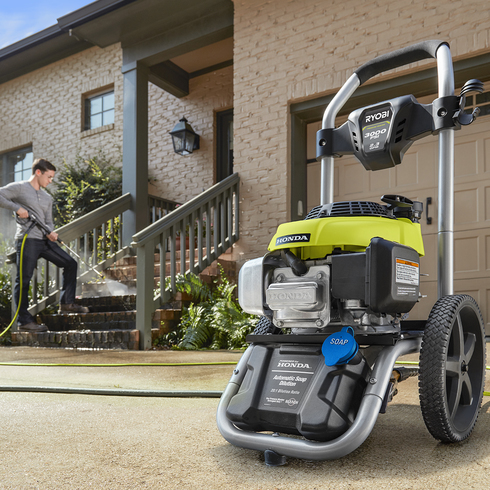 With a powerful Honda GCV160 gasoline engine, this RYOBI Pressure Washer delivers 3000-PSI of force for quick cleaning of driveways, decks, windows and other areas around the house. Featuring a durable, compact frame design and large 12 in. flat-free wheels this pressure washer is designed for easy transport. The 35 ft. non-marring high pressure hose provides 40% longer reach for access to even the toughest areas. 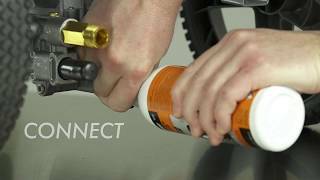 The on-board detergent tank offers hassle-free cleaning by eliminating the need to drag a bucket and hose behind you. 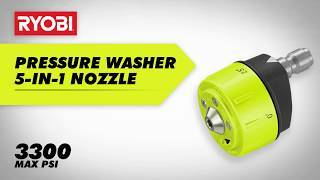 For added convenience, the RYOBI 3000-PSI Pressure Washer is equipped with a 5-in-1 quick-change-over nozzle for versatile cleaning. 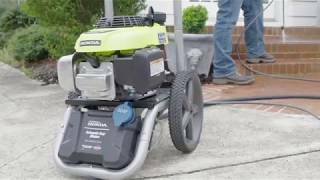 This pressure washer is backed with the RYOBI 3-Year Limited Warranty and is guaranteed to deliver results for years to come.